One cannot love what one does not understand. One cannot understand if one is not shown. This could not be truer for our often neglected and under-appreciated Renosterveld. After many years of working with farmers, it has become apparent that creating awareness among the farming communities and addressing conservation issues with farmers on a one-on-one basis is the one and only means to getting landowners to lend Renosterveld a sympathetic ear. Several landowners have commented that since working with us and since we have ‘shown’ them what they had in their veld, a whole new world has opened up for them and they are now hungry for more knowledge and more management advice. 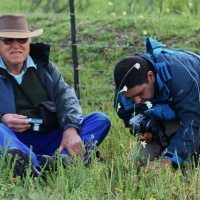 Landowners across the Overberg are realizing the fragile state of our Renosterveld and are slowly starting to commit to conserving these critical remnants. 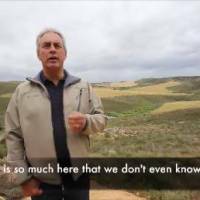 However, we have a long road to travel and without continuously building and maintaining these relationships, Renosterveld will continue on its downward spiral. We use various mediums to communicate our message, from the creation of a short movie about our work, to regular presentations at Farmer’s meetings and other interest groups, to the production of various reading material, such as management guidelines, published articles, and annual reports. 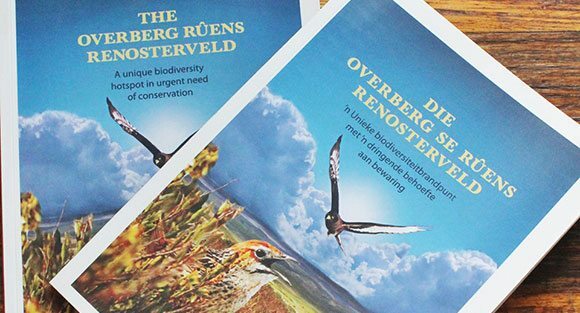 Together with our partners at BirdLife South Africa, the The Botanical Society of South Africa, SABMillerand WWF South Africa’s Better Barley Better Beer Project, the Overberg Crane Group and Sijnn Wines, we have produced a very impressive Renosterveld booklet for guiding managers and farmers on veld management and identification of some key species (from plants to insects to mammals, birds, reptiles and amphibians). These will be distributed amongst landowners and are available for retail to other individuals who might be interested, or download it here.